Wednesday noon, 7 June – RT Kendall teaches about the doctrine of gratitude. Tuesday evening, 6 June – RT Kendall teaches about the sensitivity of the Holy Spirit. RT Kendall begins to speak on the topic, “The Honour of God”. 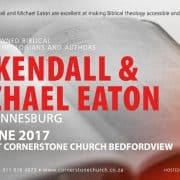 This was the fourth session of our time with RT Kendall and Michael Eaton. Monday afternoon, 5 June 2017.